Hi! Remember me? Yes, I know it has been a while since posting my last missive. Besides having had company for the last two weeks, I have been busy with driving (riding) to various military installations for a new ID card, organizing volunteers for our Home and Garden Show, and learning to play bridge. One of the ladies in our neighborhood is teaching many of our neighborhood residents. It has been fun so far. Before life got all crazy busy I had the pleasure of visiting Marian, Hortiopia, who lives in Greenville, a short hour away. Her front garden is on a slope and in the shade, quite lovely and full of many shade loving plants. Marian, ever the generous garden, shared a big clump of Hellebores with me. Wow! Her back yard borders the Reedy River and has a lot of great wildlife. 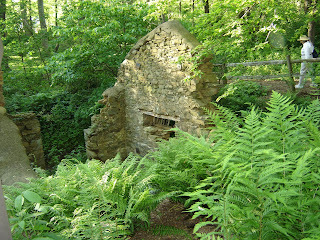 Visit her blog to see more of her wonderful garden. My visit was to talk about blogging as Marian is relatively new in the blogging world. It was a nice visit, just like two friends getting together for lunch and a walk about the garden. We talked gardens, birds (both love watching the birds), blogging, books, and the water we each live on. Marian has the loveliest collection of gardening books. Here she is next to the best collection of gardening books I have seen. Again, this generous lady gave me a book by a friend of hers. She was down to a precious few copies, and she shared one with me. Down to Earth a book by Margot Rochester, written and published not too long before she passed away. I have enjoyed reading through her book, wanting each plant she mentions. I have added some Mexican Sunflowers to my garden -- ordered some seeds last month-- thanks to Marian and Margot. 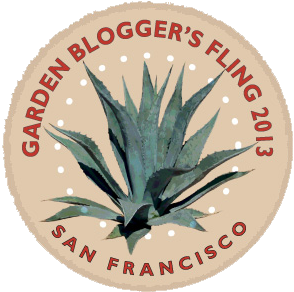 We hope to get together often --love having more garden bloggers close by! As you can see there are two books in the above photo. Low Impact Low Carbon Gardening, a winning from Donna at Gardens Eye View. Donna lives in Central New York, so her garden zone is quite different than mine, I thoroughly enjoy reading her blog. Thanks Donna! Since my last post spring has come and then stalled here in South Carolina. Many blooms have opened. My Pieris japonica 'Valley Rose' has lovely pink buds and light pink blooms. What a great shrub, while it is only about 8 inches tall, I have grand hopes for it in future years. Lots of daffodils are blooming, many of the white ones are blooming now. Below is Narcissus 'White Marvel' -- I was hoping I had it timed to bloom the same time the white fringe tree, Chionanthus retusus is blooming. If the tree blooms soon I will have succeeded...though it doesn't look close to bloom time. The banished to the garage Clivia miniata is in full bloom now. Soon the warmer weather will allow me to repot it minus the nest of ants that caused it to be banished. This is the time of year that the Loropetalum shrubs are blooming. I wanted to share the difference of the two colors I have in the garden. The one on the left is L. 'Ever Red' with its red blooms and burgundy foliage, love it! The one on the right is L. Daruma, pink blooms and a green/red foliage, depending on how mature the leaf. Oh, remember the Home and Garden Show I mentioned earlier? Well, I met another garden blogger at the show. David from Pinewood Cottage Garden stopped by our Master Gardener booth and introduced himself. What fun!! We had talked of getting together, but I was surprised when he walked up and asked if I was the Queen of Seaford! After a short conversation we agreed to visit each other's gardens once the weather allows spring to come into full swing. I am sure spring is here...or very close. I have found a number of ferns starting to emerge. I believe this one is Woodwardia virginica, Virginia Chainfern. A new bulb in my garden is a miniature tulip.... Tulipa turkestanica, is blooming now. 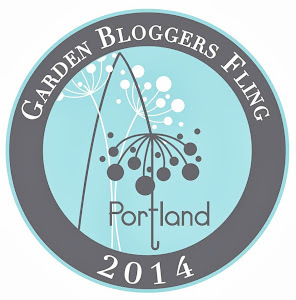 Another garden blogger I have been planning to meet in Spartanburg is DJ from Meander Mountain. DJ and Julie (Growing Days) and I have talked about a visit to Hatcher Gardens. 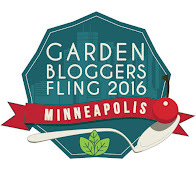 Garden blogging friends from the last fling getting together sounds like a good time doesn't it? Our Red headed Woodpecker is a frequent visitor this winter. Lately there are two.....doing a lot of fluttering around. Could baby woodpeckers be coming? On my way home from Marian's house I saw this ugly guy at the stop sign. You will be happy that I cropped the photo to eliminate the road kill he and his buddy were working on. These birds do a good job of cleaning up along the roadways. As I said in an earlier post, I will be working by way around to your blogs, catching up on my reading. Time to get back into the routine of posting and reading. I have missed you all. My Amaryllis 'Blossom Peacock' bulb that bloomed back in January is blooming again. It is not in good shape. I put the bulb in a tall glass vase, suspending it above the water by virtue of the curves of the glass and the size of the bulb. I guess the energy used to put out the first flower stalk depleted the size of the bulb just enough to let it slip into the water. I didn't see that is slipped at first so the bulb sat in the water, rotting. Once I saw it, I dumped the water to well below the bulb. I was about to give it the old 'heave ho' after the first bloom was finished as the bulb didn't look very healthy. When I was about to get rid of it I saw new leaves emerging from the soggy looking bulb. I decided to wait and see what happened. Perhaps in survival mode it put up two flower stalks! I like the picture above as the sunlight shines through the window and illuminates the blooms. Photographing this beauty is and was a challenge. The first round of bloom I used a black apron as a backdrop to give a very plain background. Great effect isn't it? Which is your favorite background, light or dark? Amazing how differently it sets off the flower. Around here spring is in the air, teasing us with one tiny bloom at a time. The Loropetalum 'Ever Red' is just starting to bloom, its blooms are such a rich red color, I really enjoy this plant. The crocuses I planted all over the yard are finally starting to bloom. C. 'Advance' had bloomed starting weeks ago, the others were in suspended animation. Here is Crocus chrysanthus 'Ladykiller' finally opened yesterday. Hooray!!! Another second flush is my Clivia miniata, who has been banished to the garage. Why? Apparently a nest of ants had taken up residence in the soil during the summer. I thought I had gotten rid of the ants, but found a trail from the container to the dog's dish....ick. The garage seems to be a good place for it. The Edgeworthia chrysantha is at its peak now, the blooms look like huge pompoms hanging on each branch. Also in the backyard is/was a Farfugium japonica, old name Ligularia. I bought it in October and it was quite happy in a semi-dry shady area... love the large green leaves. This is what I found last week-- makes you want to cry doesn't it? This hole is larger than an inch, so something other than a vole has eaten the majority of my plant. Think a rat trap is in my future. How is your garden shaping up for the beginning of spring? How did it get to be the first of the month already?? Wow, guess all the wishing for spring to come helps. The blooming fragrant plants in my garden are similar to what was fragrant last month with a few additions. Walk with me around the yard as we see what is fragrant in my garden. First, along the driveway, still blooming, Narcissus 'Grand Soleil d'Or', the yellow paperwhite. What a nice long bloom period! Walking toward the house the next fragrant (though only slightly) is my yellow crocus, Crocus chrysanthus 'Advance'. None of my other crocuses have bloomed, yet. As we head past the house and walk toward the backyard, the fragrance of the Edgeworthia is heavy on the breeze. This is the prime time for Edgeworthia chrysantha. You can smell the scent from up on the deck all the way down to the water. How many of you have purchased an Edgeworthia this year?? My work here is done. A new plant to add to the list of the fragrant blooms is Daphne genkwa, Lilac daphne. I read a number of reports that this pretty little shrub is slightly fragrant, though, I don't get any fragrance from it. I will include it in my monthly post, but can't vouch for its scent. This is an unknown Narcissus from a multi-pack of daffodils. It has a slight fragrance and really not very appealing. I can't wait for some of my really fragrant daffodils to bloom. Coming back around the house and heading back toward the front, I have a number of Viburnum tinus compacta 'Spring Bouquet'. This pretty bloom's fragrance is fleeting. I remember last year finally getting a chance to experience the fragrance. Some plants give off more fragrance at certain times during the day. Maybe I miss this one more than I catch its scent. In the front yard by the shed is one of the Daphne odora aureomarginata, Winter daphne. It has a lemony fragrance, another great winter fragrance that keeps on blooming. So glad both my Winter daphne are doing well. Finally, Osmanthus fragrans, Tea Olive, is still blooming and super fragrant. This evergreen shrub blooms from late summer through fall and winter into early spring. I have eight of them around my garden. They can reach heights of 20 feet or more. Imagine a shrub that size full of blooms -- heavenly!! What do you have fragrant in your garden?